June 26 – FIFA is to consider tightening up its concussion protocol following the World Cup in order discourage teams and players from taking unilateral decisions in defiance of strict guidelines. Talks will take place at the end of the tournament in the wake of Morocco’s Nordin Amrabat being picked to face Portugal just five days after suffering a head injury against Iran. 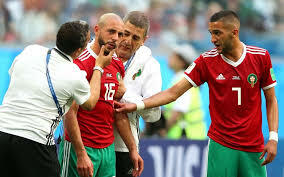 Amrabat suffered memory loss and spent one night in hospital yet Morocco blatantly ignored FIFA guidelines which state players who suffer blows to the head cannot turn out again for at least six days. He started against Portugal wearing a scrum cap but discarded it after just 16 minutes and carried on without any protection. Amrabat’s manager Herve Renard said that he been allowed to play because “he’s a warrior” but Morocco’s team doctor subsequently apologised for the transgression. FIFA’s concussion protocol, which includes players having three-minute checks on the pitch, was introduced following the 2014 World Cup when German midfielder Christoph Kramer played on for 14 minutes of the final despite a head collision and said later he couldn’t remember anything. Michel d’Hooghe, head of FIFA’s medical committee, revealed that all World Cup team doctors in Russia were instructed three months ago at a workshop to respect the guidelines and said it was time to consider whether sanctions should be imposed. “When I saw what happened with Morocco and this player, I was not just surprised but disappointed and very angry,” said d’Hooghe. D’Hooghe said it was premature to suggest team doctors could be banned and refused to specify what penalties might be imposed. But he said discussions could be held before the next meeting of his committee in September.